All eyes were on Abu Dhabi’s big-ticket entertainment and theme park Warner Bros. World Abu Dhabi as the world’s first-ever Warner Bros. branded indoor theme park offered a closer look at two of its six themed lands, Metropolis and Cartoon Junction. The themed lands feature signature rides, entertainment and restaurants – all inspired by the stories and characters from DC and Warner Bros. Animation. When it debuts to the public in the summer of 2018 on Yas Island, Warner Bros. World Abu Dhabi will feature a total of 29 state-of-the-art rides, interactive family-friendly attractions and unique live entertainment across six fully immersive lands including Metropolis, Gotham City, Cartoon Junction, Bedrock, Dynamite Gulch, and Warner Bros. Plaza. From the super-heroic action and adrenaline-fueled adventures of DC to the wacky and wonderful stories of Warner Bros. Animation–Warner Bros. World will offer captivating and interactive experiences that bring together some of the world’s most iconic characters and stories under one roof for the first time in the region. 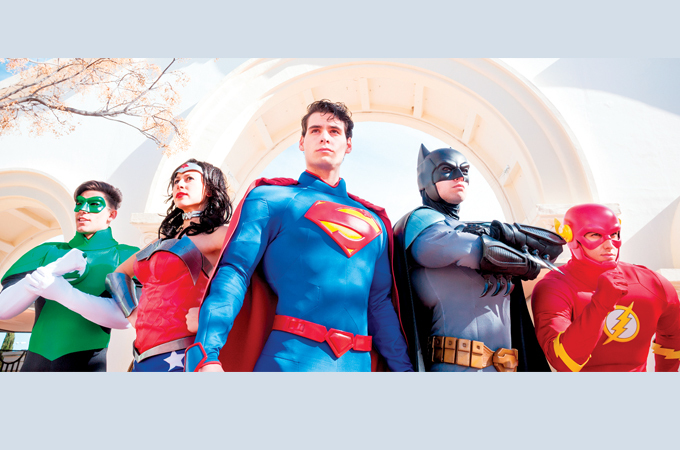 As guests walk through the iconic Warner Bros. shield, they will enter a world where Super Heroes like Batman, Superman and Wonder Woman fight for justice and animated stars like Bugs Bunny, Wile E. Coyote and Scooby-Doo come to life. Childhood memories come to life in Cartoon Junction, where guests will discover the wit and whimsy of the most iconic characters and animated stories from Looney Tunes and Hanna-Barbera. Additional animated stars like Bugs Bunny, Daffy Duck, Tweety, and many others can also be found in Cartoon Junction. Other exciting attractions featured within Cartoon Junction include Ani-Mayhem, an interactive dark ride that takes passengers on a rollicking mission to deliver their own cartoon chaos; Meet Bugs! (and Daffy), a one-of-a-kind walk-through experience at the vintage downtown theatre where guests can join Bugs Bunny on stage; and Cartoon Junction Carousel, a colourful twist on a classic carousel. Fans in search of themed-souvenirs could stop at the ACME Company Store, which is dedicated to fun and play–the Looney Tunes way; while C.J. Mercantile, Cartoon Junction’s General Store located in the town’s emporium, includes souvenirs inspired by fan-favourite characters. This vibrant land is also home to: the Hare Salon, a shopping experience that celebrates Bugs Bunny’s fun disguises; Fudd Hardware, featuring Elmer Fudd's collection of toys and tools for kids; and Daffy Snacks, where shelves are lined with colourful sweets and treats.